Mary Green looks at the hidden powers of our plants. In the old way of describing the year, February is the first month of Spring. Spring begins with Candlemas in the Christian year or Imbolc in the Celtic pagan year, both of which are at the start of February. At one time Christmas decorations were left in place until Candlemas (a custom apparently surviving just into the 20th century in some places) when winter was officially over. This way of counting spring makes much more sense, as the equinox (March 21) then falls in the middle of spring, just as the solstice (December 21) fell in the middle of winter. As you’ll know if you’ve read my articles in the past, in both traditions the plant of this season is the snowdrop, belonging with the white candles of Candlemas and Imbolc, and one of the few flowers everyone recognises. These days they often flower quite early, and mine came up by January 9 in this mild winter, so I hope they’re still flowering for Candlemas. Snowdrops are a good example of the hidden powers of plants, which is my theme for this month. So, they need another way of reproducing. Hence the bulbs. It’s no coincidence that most of our bulbs are on spring-flowering plants. Flowers that grow from bulbs can set seed like other plants. But often they don’t. Instead they store up in their bulbs the nutrition they have absorbed. The leaves die down and take the nutriments down into the bulbs, and these will come up again, or can split into two and create a new plant. That’s why it’s important never to cut off or mow the leaves of bulb plants. Snowdrops are best moved by digging them up while in leaf and after flowering – “in the green” as it’s called – which is more successful than planting bulbs and far more than using seeds. Animals like eating bulbs, not surprisingly as they are full of nutrition. Squirrels and badgers are both known for this, as well as rats and mice, especially with tulip bulbs. That’s why many plants carry poisons in their bulbs to deter them. Both snowdrops and daffodils carry galanthine: perhaps tulips are too over-bred to have it. Of course, a poison is the same as a drug. In too great quantities snowdrop and daffodil bulbs are poisonous to us. There have been reports of people eating daffodil bulbs by mistake for onions and being ill. But in the right quantities, galanthine is a drug now being used to treat dementia. This is just one example of how old plant-based remedies are being rediscovered by modern science. (I have just recovered from a wound dressed with a seaweed-derived packing. Seaweeds were traditionally used to heal wounds). You may wonder why almost all our drugs originally came from plants, since plants’ purpose in life is to reproduce themselves, not to cure human ailments! Well, because plants can’t move, the substances they carry are their best defence against predators. These poisons are produced more strongly when the plant is under stress: if grown without any danger it may not produce them. Hence, daffodils are being grown way up on cold Welsh mountainsides to produce the best galanthine. Plant substances meant as deterrents are often not entirely poisonous to us. Some, like galanthine, aspirin and so on, can be used as drugs and have always been used in herbal medicine. Others carry bitter flavours which put insects and other creatures off eating them. These plants are also often highly nutritious, traditionally forming important sources of food for us. Wild plants in the cabbage and lettuce families, and fruits of everything from tomatoes to cocoa, have been bred from wild plants to become our foods. The bitterness of the original plant is often a clue to its high nutritional content. Unfortunately, at some point in our culture we developed a taste for sugar, and gradually bred the bitterness out of our plants and the sweetness into them. So cultivated cabbages and tomatoes are higher in sugars but less nutritious than their more bitter originals. You can still taste some of the original bitterness in kale and Brussels sprouts, and especially in chicory. Remembering that plants produce more substances if under threat, it matters how they are grown. Something grown without stress in a climatically-controlled greenhouse won’t produce all its native trace elements. Plants also need to take in the complex of elements from the soil and the mycorrhizal fungi in it that will allow them to produce these. Nowadays many plants are grown hydroponically (i.e. in water with some added fertilisers) for sweetness, evenness and high yield, and lack all this complexity. Something grown in the soil of your allotment with your home-made compost, struggling against the weather, will be far better for you! 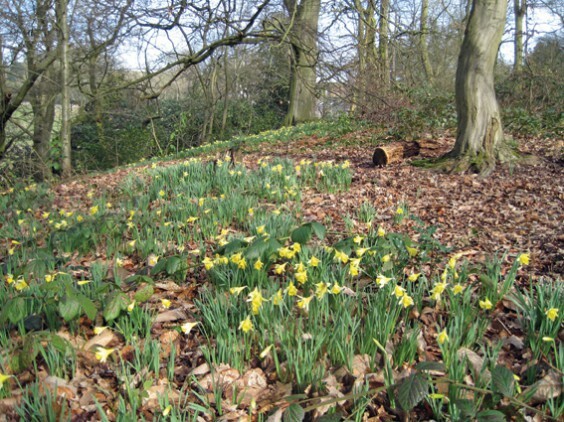 Or you could eat wild plants – but not bulbs of snowdrops, daffodils or bluebells. There is one family of bulbs you can eat, starting at this time of year. Wild garlic or ramsons, and its cousins wild leek and Cornish garlic, come into leaf from February and you can take a few leaves if you have permission. It grows well in gardens, especially Cornish or three-sided garlic, which I’ve been eating since December. Other early flowering plants have clever ways of protecting themselves. The first two bright-coloured flowers along the canal towpath in February are coltsfoot and celandine, both yellow and attractive to insects. As the weather can be very cold and wet at this time, these flowers only open in the sunshine, when the early insects will be flying. If a celandine is open in the shade, it has already been pollinated. Both these plants are old medicines. Coltsfoot was used for coughs, and you can still buy cough linctus with coltsfoot. The large, soft leaves come later in the year and were dried and used as a smoking tobacco. (Herbal tobaccos were used before the coming of actual tobacco, and later as a substitute for it, and were usually less harmful.) Celandines were used to treat piles. These early flowering plants’ survival techniques pale into insignificance next to our strangest plants – the carnivores. We have one true native carnivore, the sundew. This plant has leaves surrounded by bristles, which close over insects and then produce an enzyme which digests them. Sundew grows in boggy, peaty areas in the north and west of England, Wales and Scotland. It was used for centuries to produce a medicinal potion, especially to help the digestion of meat. Other plants like cuckoo pint and butterwort also make sticky substances to attract flies. Shepherd’s purse is something that grows commonly all around here – it lives on waste ground and in the cracks along pavements. You’ll recognise it: a small white-flowered plant in the same family as bitter-cress, thought of as a weed, but having very distinctive heart-shaped seed pods. These shed tiny seeds which fall on hard ground and have very little to grow on. However, when they get wet, they expand and form a mucilage around them. This attracts insects to feed on it, but also contains a toxin which kills the insects. The seed then absorbs the proteins from the insects, enabling it to grow on hard ground and be a highly successful plant. This reminds us that there is no such thing as a weed in nature. However, the plants we think of as weeds have something in common – they are very successful! Hence, they are often the ones with strong substances in them, many of which are usable for us as food or medicines. They are all around you in February, coming up alongside the paths, ignored by most people. Here is a February poem from a couple of years ago, and a thank you to all the people who organise and take part in all the walks in this area. Need help through the stiles, and time to sniff. Moving up and down the line to talk and see. Pass the new houses, talk about house prices. Where the cob has gone from the swan family. Everyone else by the fire or in the car. Here we are, walking, in the mud and blossom.